Bustling downtown Des Moines had been waiting for a convention center hotel for more than ten years. 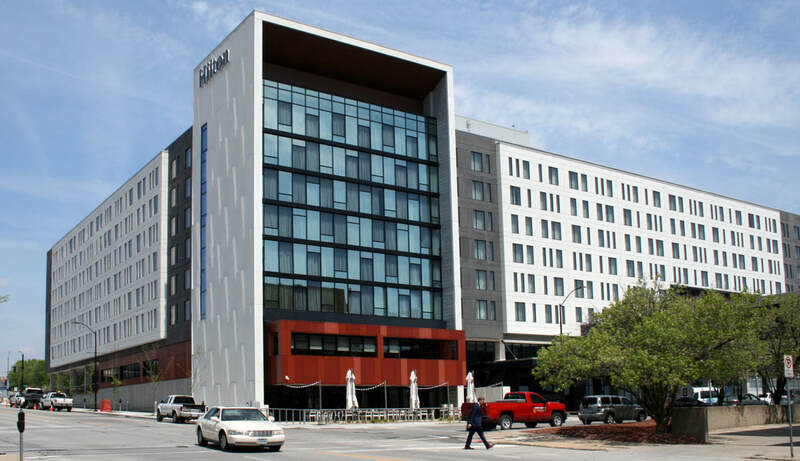 The Hilton Downtown Des Moines fills the much-awaited need as an 8-floor, 330-room hotel, with a 17,000-square-foot ballroom space, underground parking, and a full-service restaurant. Due to the high demand for the hotel, timeline was of high priority for this project. AWS worked with The Weitz Company and other trades on site to ensure the fastest possible installation of windows and curtainwall. Installing between 35 and 56 windows a day, the building was quickly enclosed, which allowed for the team to begin interior finishes as soon as possible. AWS is proud to have been a part of this meaningful project that is creating new opportunities for Des Moines, as this hotel will open Des Moines up to larger conventions, concerts, and sporting events on both a regional and national level.